It has been a busy time in both Washington, D.C. and New York and I wanted to keep you updated on the work I’ve been doing and on issues that may concern you. I recently issued the 2016 Report Card for the Second Avenue Subway, giving the MTA an A- as its current grade for the project, with the first phase due to open in December 2016 and preparation beginning for Phase 2. I’ve also been helping local non-profits add to their book shelves through the Library of Congress Surplus Books Program. I recently worked with Zone 126, a Queens-based education-related non-profit, to deliver more than 250 books to local schools. On the national stage, I continue to work for women’s rights and healthcare. President Obama signed into law a bill I wrote to create a new Breast Cancer Awareness Commemorative Coin, which will be minted in 2018 and sold to raise as much as $8.5 million in private funds for breast cancer research. I also released a new report on the gender pay gap and advocated for the Equal Rights Amendment with actress and activist Patricia Arquette. As a senior member of the House Financial Services Committee, I'm working on consumer protection, financial transparency and accountability. I’ve been fighting to protect the Consumer Financial Protection Bureau, called for a hearing on my legislation that would reduce anonymity in shell companies often used to launder money and questioned the Federal Reserve Bank of New York on the recent $81 million cyber heist from Bangladesh’s central bank’s account at the Fed. Ahead of Small Business Week, I introduced legislation that will help small businesses across our nation obtain the resources they need to grow and thrive. As always, I will continue to work in the weeks and months ahead on behalf of NY-12 constituents like you to spur job growth, advocate for and protect women’s rights, and address any concerns that you may have. Read more about these happenings below, and follow me on Twitter and Instagram at @RepMaloney for daily updates! With the first phase of the Second Avenue Subway now 94.4% complete and the MTA closing in on the final months of construction, I issued the 2016 Report Card to take stock of the MTA’s progress. The project has remained on time and on budget for the December 2016 opening date, and is looking ahead to the start of Phase 2. The MTA scores well on Project Merit, Economic Benefits, Community Outreach and Progress toward Completion of Phase 1, but weak on Mitigation of Construction Impact, Equipment Testing and Seamless Transition to Phase 2. In recognition of the significant progress to date, the MTA earns an overall A-, up from a B+ on the last report card. To learn more about the project’s progress, and the report card, see the story at NY1. Partnering with Zone 126, an organization that focuses on building a cradle-to-career pipeline for children in Queens, I worked with the Library of Congress Surplus Books Program to deliver more than 250 new books to schools in New York City School District 30 in an effort to boost literacy and a love of reading. We distributed fiction, non-fiction, and test prep books. Any non-profit organization in my district with a library can apply for books through the Surplus Books Program and I hope this is the first of many deliveries. To learn more about this program, and apply for books for your school or nonprofit organization, visit my website. Responding to a letter I organized with the local elected officials, the MTA has begun holding a series of meetings to explain the need for repairs to the 100 year old Canarsie Tube that takes over 250,000 New Yorkers under the East River between Manhattan and Brooklyn each day. The aging tunnel, which flooded badly during Superstorm Sandy with 7 million gallons of corrosive saltwater from the East River, had been in need of rejuvenation even before the storm. Ridership on the L Train has risen nearly 240% since 1990, with an increase of nearly 470% at Bedford Avenue alone. I was pleased to be able to speak at the first meeting and asked the MTA to open a community information center so that commuters can get up-to-date information regarding the project and transportation alternatives, and can bring their questions and concerns to MTA staff. Read the Politico New York story about the meeting. On April 29, President Obama signed the Breast Cancer Awareness Commemorative Coin Act that will create a coin to raise money for breast cancer research and help educate the public about the disease. The minting of this coin will come at no cost to the American taxpayer and can raise an estimated $8.5 million for the Breast Cancer Research Foundation, which allocates more than 90% of its funding to cancer research and public awareness programs. There will be a public competition for the coin’s design, so keep an eye out for future updates. Read the Associated Press story to learn more. In recognition of Equal Pay Day, I was joined by Academy Award Winner and activist Patricia Arquette as I released a new report from the Democratic staff of the Joint Economic Committee showing the devastating consequences of the gender pay gap on women, families and the economy. We met with various Members of Congress to discuss the gender pay gap and the findings of the report, which examines this disparity across age, race and location. Together, we advocated for the Equal Rights Amendment, which will finally put women into the Constitution. 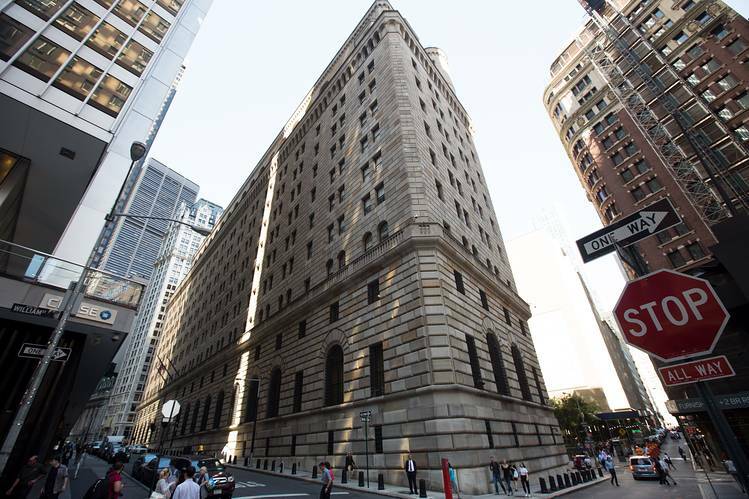 What Happened at the NY Fed? In February 2016, hackers attempted to transfer nearly $1 billion from the Bangladesh central bank’s account at the Federal Reserve of New York to fake accounts set up in the Philippines and Sri Lanka. While most of those transfers were stopped, the thieves got away will $81 million. The Federal Reserve Bank of New York has responded to my March 22 letter, asking for answers on the bank’s actions in the heist. While the bank’s response provides key information about the Bangladesh Bank incident, I remain concerned that there are critical security gaps in the international payment system. I will be urging the New York Fed to expedite its review of its security protocols to ensure that this kind of brazen cyber heist doesn’t happen again. We must ensure the safety and soundness of international monetary transactions. Following the release of the “Panama Papers,” I called on the House Committee on Financial Services to move forward on my legislation that would reduce anonymity in shell companies. It is clear that many of the tactics used by shady operators in Panama are also being used here. Accordingly, it is long past time to end the rampant abuse of anonymous shell companies in the U.S. – criminals and corrupt officials should not be able to hide behind a corporate shield. The Guardian explains why it is so easy to hide money in the U.S.
Reuters reports on my letter calling for a legislative hearing on my bill to combat this issue. Learn more about what the Administration is doing to combat this issue at the Washington Post. Small businesses are critical engines of economic development and job creation but in many communities, there are no local banks or banks will not lend to startup businesses, leaving businesses owners unable to access the credit they need in order to grow. That’s why I’ve introduced the Investing in America’s Small Businesses Act, which will expand the amount of money community development financial institutions have to lend to small companies so these companies can invest in new equipment and supplies that they need in order to grow, helping not only the businesses but the communities in which they operate. Learn more about the Investing in America’s Small Business Act of 2016 on website.